I ended up eating lunch at like 3pm and ended up going to White Spot at Oakridge since it was convenient and also they have happy hour from 3-6pm so I thought I’d take advantage of that. Also I saw pictures of their new burger guest stars on Instagram and they looked good. Unfortunately we did not end up picking appies that qualified for happy hour because a) I can’t read the menu obviously and b) even though I checked with the server and she was like yup yup it turned out that it was a nope nope >.> so we ended up feeling ripped off after and I could’ve ordered other stuff that was more worth the money. 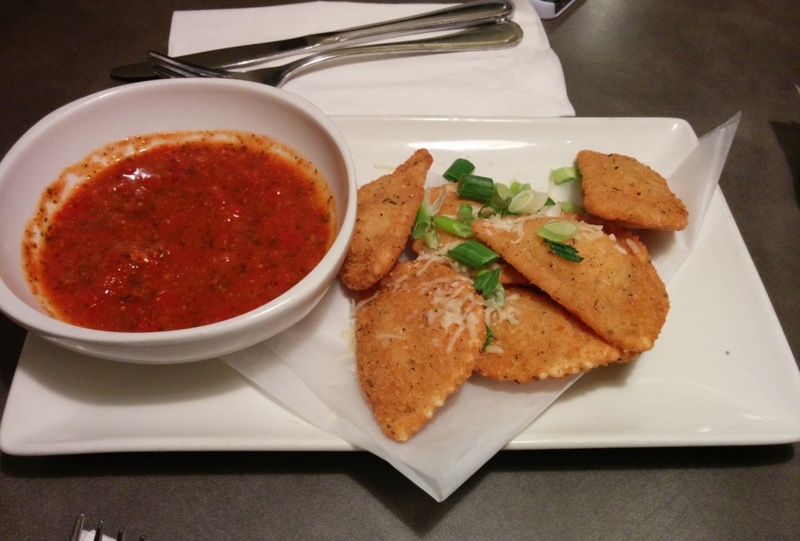 This was the Crispy Three Cheese Ravioli filled with mozzarella, parmesan and ricotta cheese and served with arrabiata sauce. The ravioli were fried and cheesy inside but tasted mostly doughy and all the different cheeses they used didn’t seem to have much of an impact. 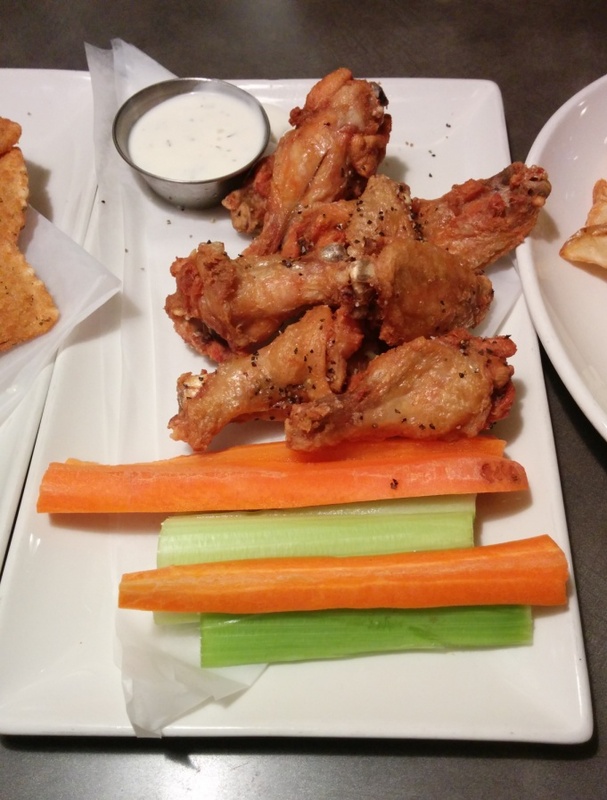 These were the Salt and Pepper Chicken wings served with veggies and zoo dip. The wings were really small and dry which was disappointing but then again I wasn’t expecting really big wings from White Spot but at least they shouldn’t be dry. I don’t think I’ve tried the zoo dip before but it was a really weak version of ranch dip and it didn’t cut it for me since it didn’t seem to have any flavour at all. 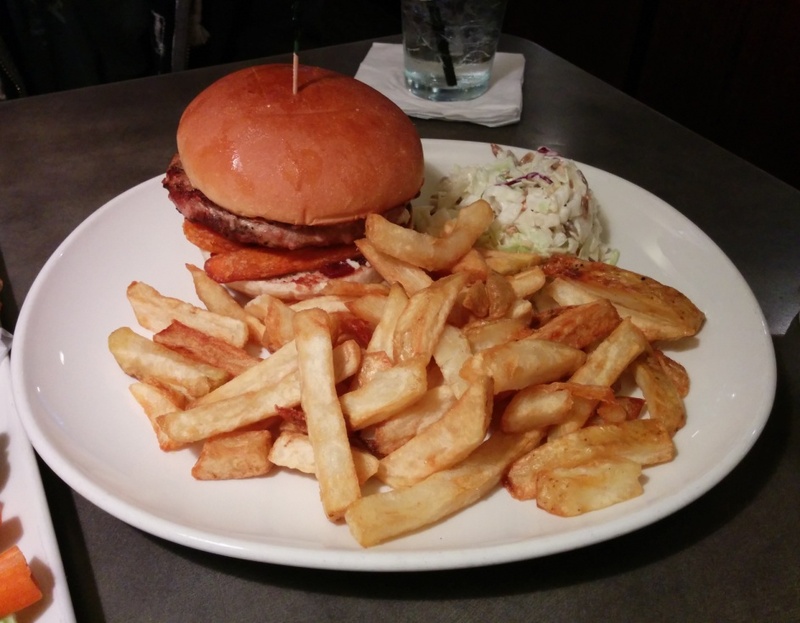 The best thing we ordered was the Harvest Turkey Poutine Burger with coleslaw and the usual endless fries. Touted as a Thanksgiving dinner in a bun, this was a turkey burger with sweet potato fries, cheese curds, gravy, cranberry relish and mayo. I loved the sweet potato fries used for the “poutine” part and I liked the sweetness from the cranberry relish since burgers aren’t usually sweet but it seemed to work here. The fries were their usual thick starchy ones I don’t like but end up eating anyway. Moral of the story: stick to the burgers and read the menu carefully! This entry was posted in American/Burgers, Food Reviews and tagged burgers, fries, poutine, ravioli, wings. That’s too bad =( You should talk to management about it and see if they will do anything about it!